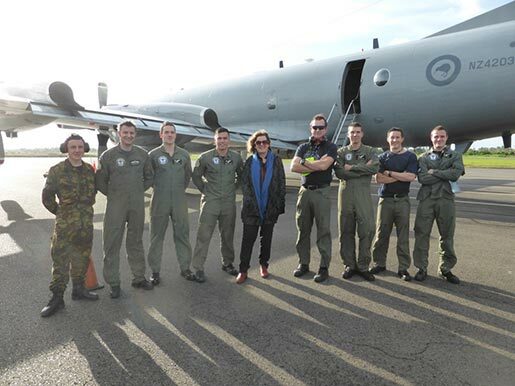 The best way to fly to Fiji – on an RNZAF P3 Orion! This is me with some of the crew just after we landed at Nausori after a fascinating seven hour flight from Auckland to Fiji. This was part of ‘Operation Big Eye’ (Pacific Fisheries Patrol) so there was a lot of swooping down to 300 feet as we inspected fishing vessels and reefs. And the onboard cooking was brilliant – eggs Benedict for brunch, steak, onions and wedges for late lunch. An amazing day. This was the beginning of a week researching the RNZAF in Fiji, with an emphasis on the seaplane station at Laucala Bay, Suva. 29 July 2015. I look forward to your book on the RNZAF in Fiji, with emphasis on Laucala Bay. As an aircrew member on Sunderlands during the last three years of its operation I enjoyed a number of detachments to the “Bay” and crewed the very last Sunderland flight from the “Bay” to Hobsonville on the 2nd April 1967. An end to a great era in the RNZAF’s history. Just found this on my website… sorry for the tardy response. I was most interested to hear that you’d crewed the last Sunderland to fly from Laucala Bay. I’d be keen to have your recollections of this – all colourful stories enthusiastically received. I have just found out that my father served with the RNZAF at Laucala Bay in 1948. His name was George William Lewis. I think he was an M T Fitter and he may have been NCO I/c Transport Section. I don’t know anything about him at all, so I would be interested to read your book. When will it be published? Sorry about the tardy reply but I’ve only just discovered your comment on my website. Obviously I don’t check it often enough! I’m delighted to report that the book is finished and that I have an advance copy on the desk beside me. There are lots of lovely tales and many images which should do much to evoke those Laucala Bay days. I would be very interested in your book, as after being in our local Home Guard, my Dad enlisted in the RNZAF, training in Wigram, then Ohakea, then Rongatai, before going to Laucala Bay, where he spent the rest of the war. He was part of the team building the breakwater, and servicing the Flying Boats.I remember him telling me stories about his time there, and I would love to read more about it. He did tell a story about propaganda pamphlets being dropped at Christmas, by a Japanese aircraft, wishing them a Merry Christmas and something about them waiting for the breakwater to be finished so they could then come back and bomb it. I have a few photos that may be of interest to you, of the men working on the aircraft, and a couple of others. granted £1 per week war pension because of hearing loss. Can you advise how I can obtain a copy of your book please? It would be great to add to my Family History resources, I wasn’t born until July 1945, by which time he was home and back on civvy street.